Madrid's Palacio de Cibeles recently underwent a stunning renovation that respectfully preserved the beautiful old building while creating a friendly cultural center that is open to the public. Dubbed CentroCentro and designed by Arquimatica architectural studio, this jaw-dropping modern space offers Spanish citizens and visitors to the capital, a place to exchange cultural information and engage in contemporary life and culture. CentroCentro is the perfect example of how an architectural building from the beginning of the 20th century can be brought up to date with contemporary sustainable building strategies - from green materials and natural light optimization to resource conservation and energy-efficient systems. Originally designed by architects Antonio Palacios y Joaquin Otamendi, Palacio de Cibeles (also known as Communications Palace) opened its doors in 1919 and quickly became a symbol of modernization and progress. This impressive cathedral-like landmark was first home to the City Hall Postal and Telegraphic Museum until 2007 when it became Madrid’s official City Hall and a central hub within the city. It took Arquimatica five years to restore the Communications Palace, over the course of which they adapted the existing monumental building, objects and materials to serve new uses and needs. Original lamps, wooden desks, furniture, marble floors, brass fittings, tiles and other details have been restored delicately by hand in order to preserve the original character and atmosphere of this fantastic building. In addition to the restoration of original pieces, several private rooms were opened to the public, internal space distribution and circulation was changed, and ceilings were lifted to create open spaces that permit more natural light and allow ideas to grow and flow. The “central operational yard” is still the soul of the building. 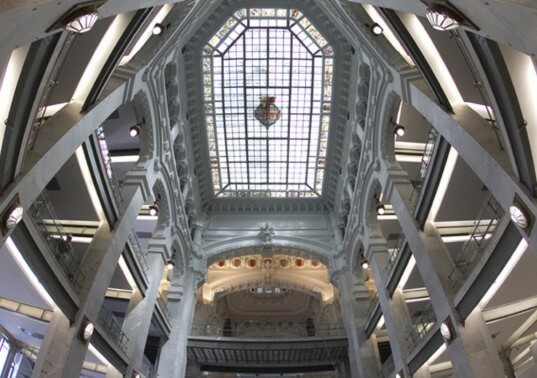 The big front windows overlooking the street’s plaza have been re-opened, and the beautiful glass skylight panels and original crystal tiled floor have been cleaned and restored to allow natural light to shine all the way down to the basement floor. 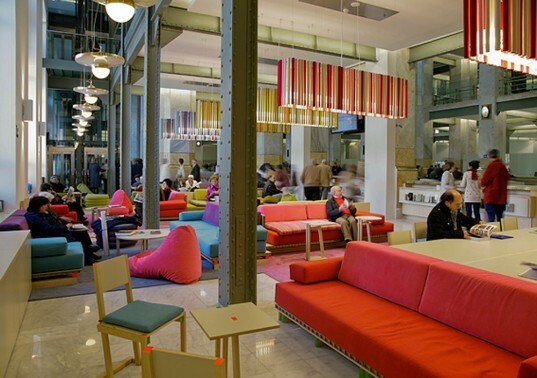 Both ends of the central yard have been designated as social areas, where visitors can go to learn about the cultural activities that the bustling Spanish capital has to offer. As a contrast to the classic-but-cold building’s architecture, these people-friendly areas are designed to combine innovation, information, and comfort. This bright, bold and open spaces feature colorful sofas and bean bags, wooden furniture that is designed for disassembly, and recycled honeycomb cardboard tables. All the furniture from these areas has been specially designed for the context to make visitors feel at home. Newspapers, brochures and books are available on small side tables and shelves, while the striped hanging lamps are replicas of the fixtures that Antonio Palacios designed back at the time. One of the most striking features of CentroCentro is the ceiling’s Crystal Gallery roof. The structure rises over the building’s backyard and measures almost 10,000 square feet, weighs 500 tons, and stands 98 feet high. It was constructed using 2,000 triangular glass panels that were hand-assembled using bars and knots. The building’s original 200 foot-tall tower designed to store antennas and other communication artifacts is also now open to the public. The clean, metallic structure is ornament-free, and it holds a restaurant on the 6th floor. A gorgeous open-air watchtower situated within the terrace offering lucky visitors a unique view of the Madrid skyline. The building’s auditorium offers space for 296 spectators and features an amazing interior made from triangular wood panels. The magnificent room was inspired by music boxes, and it boasts excellent acoustics for chamber music concerts. Arquimatica architectural studio was created by Francisco Rodriguez Partearroyo and partners David Marquez Latorre, Angel Martinez Diaz and Francisco Martinez Diez. 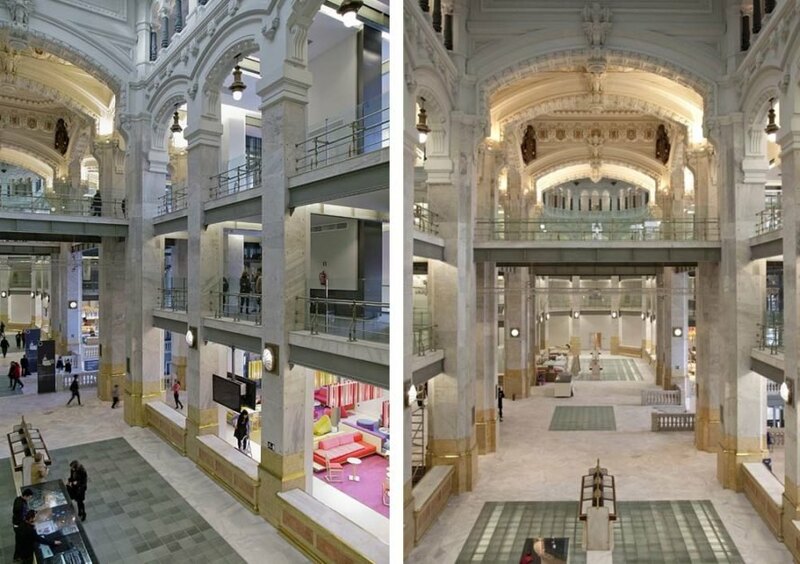 They specialize in the refurbishment and regeneration of large-scale cultural and educational public spaces, and they count Madrid’s recently opened CentroCentro among their most important work to date. After all, it is the city’s soul and a national platform for formulating new ideas. The "central operational yard" is still the soul of the building. The big front windows overlooking the street’s plaza have been re-opened, and the beautiful glass skylight panels and original crystal tiled floor have been cleaned and restored to allow natural light to shine all the way down to the basement floor. Both ends of the central yard have been designated as social areas, where visitors can go to learn about the cultural activities that the bustling Spanish capital has to offer. As a contrast to the classic-but-cold building’s architecture, these people-friendly areas are designed to combine innovation, information, and comfort. This bright, bold and open spaces feature colorful sofas and bean bags, wooden furniture that is designed for disassembly, and recycled honeycomb cardboard tables. All the furniture from these areas has been specially designed for the context to make visitors feel at home. Newspapers, brochures and books are available on small side tables and shelves, while the striped hanging lamps are replicas of the fixtures that Antonio Palacios designed back at the time. 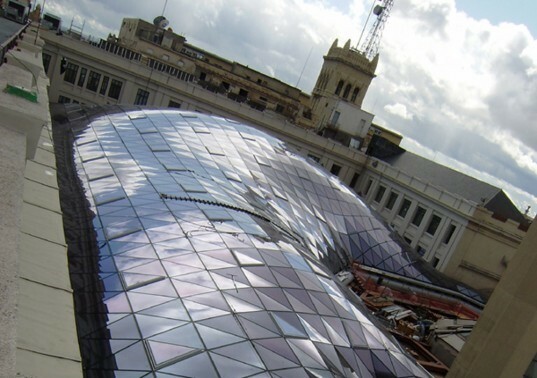 One of the most striking features of CentroCentro is its new Crystal Gallery roof. The structure rises over the building's backyard and measures almost 10,000 square feet, weighs 500 tons, and stands 98 feet high. It was constructed using 2,000 triangular glass panels that were hand-assembled using bars and knots. The building’s original 200 foot-tall tower designed to store antennas and other communication artifacts is also now open to the public. The clean, metallic structure is ornament-free, and it holds a restaurant on the 6th floor. A gorgeous open-air watchtower situated within the terrace offers lucky visitors a unique view of the Madrid skyline. 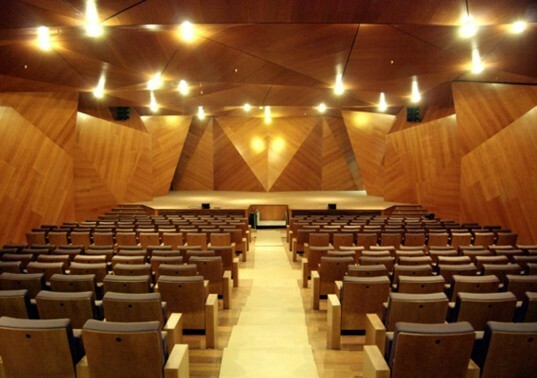 The building's auditorium offers space for 296 spectators and features an amazing interior made from triangular wood panels.